Considering that most loveys, doudous and comfort blankets are generally dragged around until they reach levels of untold grubbiness, isn’t it odd that they tend to come in pale colours? Thankfully, manufacturers seem to agree and there’s a new wave of bold and beautiful options to choose from. Here are five of my favourites. 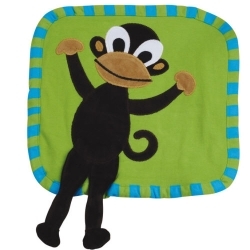 First up, this luscious lime Lipfish mini blanket is adorable – what child wouldn’t fall in love with this funky monkey design, complete with dangly legs to clutch? Â£14 from Scallywag Toys. 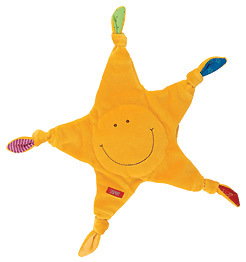 This vibrant yellow Esprit Star doudou is an injection of pure sunshine and features a squishy centre, multicoloured tags and knots to keep baby entertained. Â£10.99 from Stork Gifts. 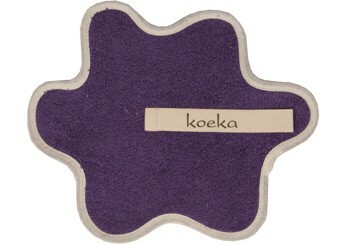 Funky Dutch brand KoeKa has come up trumps with its splat-shaped towelling comforting cloths in 15 shades. Pick your favourite for â‚¬ 7,95 from the treasure trove that is Little Zebra (I challenge you to resist filling your shopping cart!). 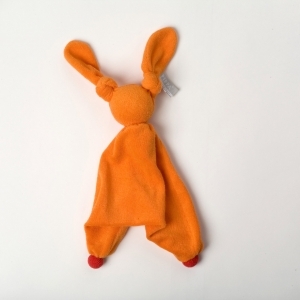 Green mums will love Babylonia’s fair-trade, eco-friendly Peppa Sloppy – a knotted cotton towelling comforter with a hint of rabbit, which has a pure wool-stuffed head to absorb familiar scents. The best price I found for this was Â£6 at Green Me. Finally, for something completely different, you can’t beat the slightly mental Baby Deglingos. I love the googly-eyed craziness of the Molos lobster design. Â£15 at Jelly the Worm’s Toy Shop.